For other uses, see Positron (disambiguation). 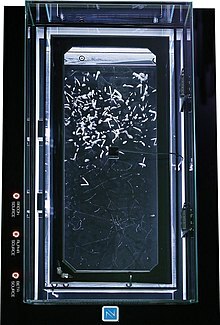 Cloud chamber photograph by C. D. Anderson of the first positron ever identified. A 6 mm lead plate separates the chamber. The deflection and direction of the particle's ion trail indicate that the particle is a positron. In 1928, Paul Dirac published a paper proposing that electrons can have both a positive and negative charge. This paper introduced the Dirac equation, a unification of quantum mechanics, special relativity, and the then-new concept of electron spin to explain the Zeeman effect. The paper did not explicitly predict a new particle but did allow for electrons having either positive or negative energy as solutions. Hermann Weyl then published a paper discussing the mathematical implications of the negative energy solution. The positive-energy solution explained experimental results, but Dirac was puzzled by the equally valid negative-energy solution that the mathematical model allowed. Quantum mechanics did not allow the negative energy solution to simply be ignored, as classical mechanics often did in such equations; the dual solution implied the possibility of an electron spontaneously jumping between positive and negative energy states. However, no such transition had yet been observed experimentally. Robert Oppenheimer argued strongly against the proton being the negative-energy electron solution to Dirac's equation. He asserted that if it were, the hydrogen atom would rapidly self-destruct. Persuaded by Oppenheimer's argument, Dirac published a paper in 1931 that predicted the existence of an as-yet-unobserved particle that he called an "anti-electron" that would have the same mass and the opposite charge as an electron and that would mutually annihilate upon contact with an electron. Feynman, and earlier Stueckelberg, proposed an interpretation of the positron as an electron moving backward in time, reinterpreting the negative-energy solutions of the Dirac equation. Electrons moving backward in time would have a positive electric charge. Wheeler invoked this concept to explain the identical properties shared by all electrons, suggesting that "they are all the same electron" with a complex, self-intersecting worldline. Yoichiro Nambu later applied it to all production and annihilation of particle-antiparticle pairs, stating that "the eventual creation and annihilation of pairs that may occur now and then is no creation or annihilation, but only a change of direction of moving particles, from the past to the future, or from the future to the past." The backwards in time point of view is nowadays accepted as completely equivalent to other pictures, but it does not have anything to do with the macroscopic terms "cause" and "effect", which do not appear in a microscopic physical description. Carl David Anderson discovered the positron on 2 August 1932, for which he won the Nobel Prize for Physics in 1936. Anderson did not coin the term positron, but allowed it at the suggestion of the Physical Review journal editor to whom he submitted his discovery paper in late 1932. The positron was the first evidence of antimatter and was discovered when Anderson allowed cosmic rays to pass through a cloud chamber and a lead plate. A magnet surrounded this apparatus, causing particles to bend in different directions based on their electric charge. The ion trail left by each positron appeared on the photographic plate with a curvature matching the mass-to-charge ratio of an electron, but in a direction that showed its charge was positive. Anderson wrote in retrospect that the positron could have been discovered earlier based on Chung-Yao Chao's work, if only it had been followed up on. Frédéric and Irène Joliot-Curie in Paris had evidence of positrons in old photographs when Anderson's results came out, but they had dismissed them as protons. The positron had also been contemporaneously discovered by Patrick Blackett and Giuseppe Occhialini at the Cavendish Laboratory in 1932. Blackett and Occhialini had delayed publication to obtain more solid evidence, so Anderson was able to publish the discovery first. Positrons are produced naturally in β+ decays of naturally occurring radioactive isotopes (for example, potassium-40) and in interactions of gamma quanta (emitted by radioactive nuclei) with matter. Antineutrinos are another kind of antiparticle produced by natural radioactivity (β− decay). Many different kinds of antiparticles are also produced by (and contained in) cosmic rays. In research published in 2011 by the American Astronomical Society positrons were discovered originating above thunderstorm clouds; positrons are produced in gamma-ray flashes created by electrons accelerated by strong electric fields in the clouds. Antiprotons have also been found to exist in the Van Allen Belts around the Earth by the PAMELA module. decay can be considered both artificial and natural production, as the generation of the radioisotope can be natural or artificial. Perhaps the best known naturally-occurring radioisotope which produces positrons is potassium-40, a long-lived isotope of potassium which occurs as a primordial isotope of potassium. Even though a small percent of potassium (0.0117%) it is the single most abundant radioisotope in the human body. In a human body of 70 kg mass, about 4,400 nuclei of 40K decay per second. The activity of natural potassium is 31 Bq/g. About 0.001% of these 40K decays produce about 4000 natural positrons per day in the human body. These positrons soon find an electron, undergo annihilation, and produce pairs of 511 keV gamma rays, in a process similar (but much lower intensity) to that which happens during a PET scan nuclear medicine procedure. Recent observations indicate black holes and neutron stars produce vast amounts of positron-electron plasma in astrophysical jets. Large clouds of positron-electron plasma have also been associated with neutron stars. Preliminary results from the presently operating Alpha Magnetic Spectrometer (AMS-02) on board the International Space Station show that positrons in the cosmic rays arrive with no directionality, and with energies that range from 10 GeV to 250 GeV. In September 2014, new results with almost twice as much data were presented in a talk at CERN and published in Physical Review Letters. A new measurement of positron fraction up to 500 GeV was reported, showing that positron fraction peaks at a maximum of about 16% of total electron+positron events, around an energy of 275 ± 32 GeV. At higher energies, up to 500 GeV, the ratio of positrons to electrons begins to fall again. The absolute flux of positrons also begins to fall before 500 GeV, but peaks at energies far higher than electron energies, which peak about 10 GeV. These results on interpretation have been suggested to be due to positron production in annihilation events of massive dark matter particles. Positrons, like anti-protons, do not appear to originate from any hypothetical "antimatter" regions of the universe. On the contrary, there is no evidence of complex antimatter atomic nuclei, such as antihelium nuclei (i.e., anti-alpha particles), in cosmic rays. These are actively being searched for. A prototype of the AMS-02 designated AMS-01, was flown into space aboard the Space Shuttle Discovery on STS-91 in June 1998. By not detecting any antihelium at all, the AMS-01 established an upper limit of 1.1×10−6 for the antihelium to helium flux ratio. Physicists at the Lawrence Livermore National Laboratory in California have used a short, ultra-intense laser to irradiate a millimeter-thick gold target and produce more than 100 billion positrons. Presently significant lab production of 5 MeV positron-electron beams allows investigation of multiple characteristics such as how different elements react to 5 MeV positron interactions or impacts, how energy is transferred to particles, and the shock effect of gamma-ray bursts (GRBs). The ALPHA experiment combines positrons with antiprotons to study properties of antihydrogen. Mohr, P. J.; Taylor, B. N.; Newell, D. B. (2008). "CODATA recommended values of the fundamental physical constants". Reviews of Modern Physics. 80 (2): 633–730. arXiv:0801.0028. Bibcode:2008RvMP...80..633M. CiteSeerX 10.1.1.150.1225. doi:10.1103/RevModPhys.80.633. "The NIST Reference on Constants, Units and Uncertainty". National Institute of Standards and Technology. Retrieved 24 October 2013. ^ Dirac, P. A. M. (1928). "The quantum theory of the electron" (PDF). Proceedings of the Royal Society A. 117 (778): 610–624. Bibcode:1928RSPSA.117..610D. doi:10.1098/rspa.1928.0023. ^ Weyl, H. (1929). "Gravitation and the Electron" (PDF). PNAS. 15 (4): 323–334. Bibcode:1929PNAS...15..323W. doi:10.1073/pnas.15.4.323. PMC 522457. PMID 16587474. ^ Dirac, P. A. M. (1930). "A theory of electrons and protons" (PDF). Proceedings of the Royal Society A. 126 (801): 360–365. Bibcode:1930RSPSA.126..360D. doi:10.1098/rspa.1930.0013. ^ Close, F. (2009). Antimatter. Oxford University Press. p. 46. ISBN 978-0-19-955016-6. ^ Dirac, P. A. M. (1931). "Quantised Singularities in the Quantum Field" (PDF). Proceedings of the Royal Society A. 133 (821): 60–72. Bibcode:1931RSPSA.133...60D. doi:10.1098/rspa.1931.0130. ^ Feynman, R. (1949). "The theory of positrons". Physical Review. 76 (6): 749–759. Bibcode:1949PhRv...76..749F. doi:10.1103/PhysRev.76.749. ^ Feynman, R. (11 December 1965). The Development of the Space-Time View of Quantum Electrodynamics (Speech). Nobel Lecture. Retrieved 2 January 2007. ^ Nambu, Y. (1950). "The Use of the Proper Time in Quantum Electrodynamics I". Progress of Theoretical Physics. 5 (1): 82–94. Bibcode:1950PThPh...5...82N. doi:10.1143/PTP.5.82. ^ Close, F. (2009). Antimatter. Oxford University Press. pp. 50–52. ISBN 978-0-19-955016-6. ^ Cowan, E. (1982). "The Picture That Was Not Reversed". Engineering & Science. 46 (2): 6–28. ^ a b Merhra, J.; Rechenberg, H. (2000). The Historical Development of Quantum Theory, Volume 6: The Completion of Quantum Mechanics 1926–1941. Springer. p. 804. ISBN 978-0-387-95175-1. ^ Anderson, C. D. (1933). "The Positive Electron". Physical Review. 43 (6): 491–494. Bibcode:1933PhRv...43..491A. doi:10.1103/PhysRev.43.491. ^ "The Nobel Prize in Physics 1936". Retrieved 21 January 2010. ^ a b Gilmer, P. J. (19 July 2011). "Irène Jolit-Curie, a Nobel laureate in artificial radioactivity" (PDF). p. 8. Retrieved 13 July 2013. ^ Palmer, J. (11 January 2011). "Antimatter caught streaming from thunderstorms on Earth". BBC News. Archived from the original on 12 January 2011. Retrieved 11 January 2011. ^ Adriani, O.; et al. (2011). "The Discovery of Geomagnetically Trapped Cosmic-Ray Antiprotons". The Astrophysical Journal Letters. 737 (2): L29. arXiv:1107.4882. Bibcode:2011ApJ...737L..29A. doi:10.1088/2041-8205/737/2/L29. ^ Than, K. (10 August 2011). "Antimatter Found Orbiting Earth—A First". National Geographic Society. Retrieved 12 August 2011. ^ "What's the Matter with Antimatter?". NASA. 29 May 2000. Archived from the original on 4 June 2008. Retrieved 24 May 2008. ^ "Radiation and Radioactive Decay. Radioactive Human Body". Harvard Natural Sciences Lecture Demonstrations. Retrieved 18 May 2011. ^ Wintergham, F. P. W. (1989). Radioactive Fallout in Soils, Crops and Food. Food and Agriculture Organization. p. 32. ISBN 978-92-5-102877-3. ^ Engelkemeir, D. W.; Flynn, K. F.; Glendenin, L. E. (1962). "Positron Emission in the Decay of K40". Physical Review. 126 (5): 1818. Bibcode:1962PhRv..126.1818E. doi:10.1103/PhysRev.126.1818. ^ "Vast Cloud of Antimatter Traced to Binary Stars". NASA. ^ Accardo, L.; et al. (AMS Collaboration) (2014). "High Statistics Measurement of the Positron Fraction in Primary Cosmic Rays of 0.5–500 GeV with the Alpha Magnetic Spectrometer on the International Space Station" (PDF). Physical Review Letters. 113 (12): 121101. Bibcode:2014PhRvL.113l1101A. doi:10.1103/PhysRevLett.113.121101. PMID 25279616. ^ Schirber, M. (2014). "Synopsis: More Dark Matter Hints from Cosmic Rays?". Physical Review Letters. 113 (12): 121102. arXiv:1701.07305. Bibcode:2014PhRvL.113l1102A. doi:10.1103/PhysRevLett.113.121102. PMID 25279617. ^ "New results from the Alpha Magnetic Spectrometer on the International Space Station" (PDF). AMS-02 at NASA. Retrieved 21 September 2014. ^ Aguilar, M.; et al. (2013). "First Result from the Alpha Magnetic Spectrometer on the International Space Station: Precision Measurement of the Positron Fraction in Primary Cosmic Rays of 0.5–350 GeV" (PDF). Physical Review Letters. 110 (14): 141102. Bibcode:2013PhRvL.110n1102A. doi:10.1103/PhysRevLett.110.141102. PMID 25166975. ^ Aguilar, M.; et al. (AMS Collaboration) (2002). "The Alpha Magnetic Spectrometer (AMS) on the International Space Station: Part I – results from the test flight on the space shuttle". Physics Reports. 366 (6): 331–405. Bibcode:2002PhR...366..331A. doi:10.1016/S0370-1573(02)00013-3. hdl:2078.1/72661. ^ Bland, E. (1 December 2008). "Laser technique produces bevy of antimatter". MSNBC. Retrieved 6 April 2016. The LLNL scientists created the positrons by shooting the lab's high-powered Titan laser onto a one-millimeter-thick piece of gold. ^ Phelps, M. E. (2006). PET: physics, instrumentation, and scanners. Springer. pp. 2–3. ISBN 978-0-387-32302-2. ^ "Introduction to Positron Research". St. Olaf College. Archived from the original on 5 August 2010. Wikimedia Commons has media related to Positrons. Synopsis: Tabletop Particle Accelerator ... new tabletop method for generating electron–positron streams.